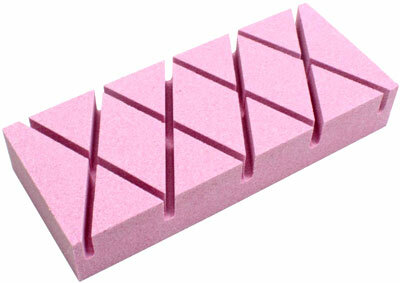 A flattening block is used to dress stones that are no longer flat enough to sharpen properly. 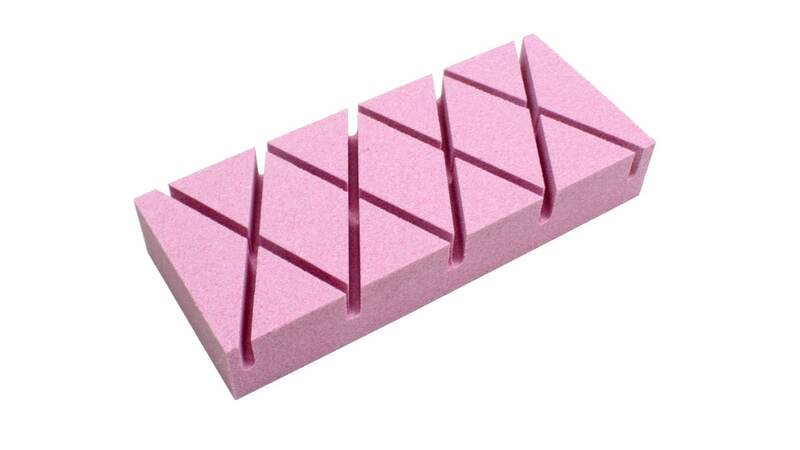 A flat stone is indispensable for effective sharpening, especially of flat chisels and plane blades. To quickly flatten a stone, you simply move it across the surface of the flattening block with circular or back and forth movements. 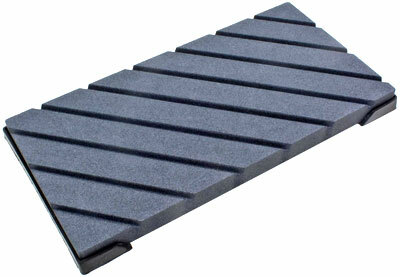 A steel flattening block should be used only with silicon carbide powder. A silicon carbide flattening block can be used without powder but you can speed up the process if you spread a little silicon carbide powder on the block. 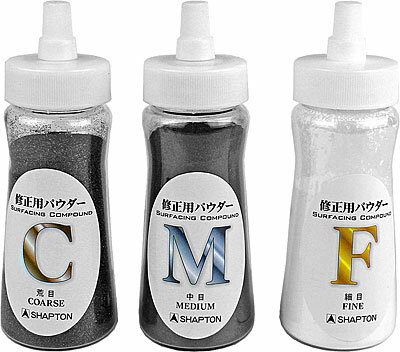 The latter method is strongly recommended for hard stones like those available from Shapton. But remember, if you use an abrasive powder you must afterwards rinse the sharpening stone thoroughly with water. This flattening stone with its smaller surface is harder to handle than the larger version and it takes more experience and effort to achieve a good result. With these comfortably sized flattening stones, you can very quickly resurface hollowed sharpening stones so that they are flat and true again. 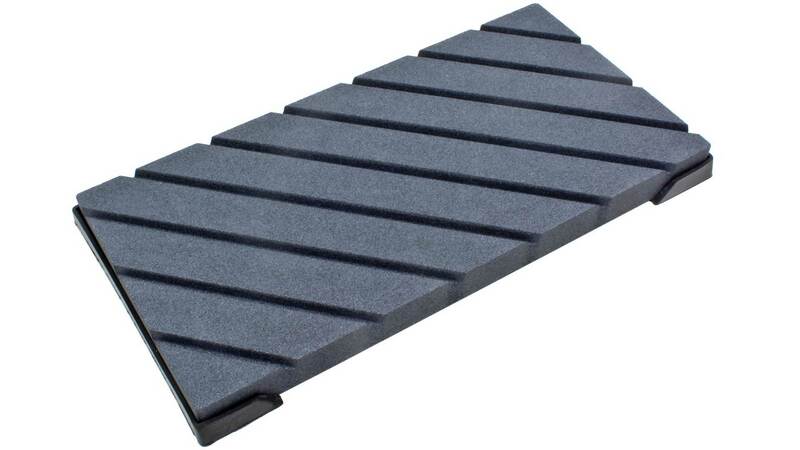 In contrast to the other flattening stones listed above, which are made of silicon carbide, these stones are made of aluminum oxide, which is a sharper, more abrasive material and cuts faster than the silicon carbide. Manganese is added to increase the dimensional stability of these stones, which is why they are pink. To keep these blocks flat, you can rub two of them together, even if they have different grain sizes. Use these abrasives on lapping plates or truing stones for fast results when flattening water stones. Note: Not for use on diamond flattening plates! Which powder for my stones? The additive of choice for flattening whetstones. You can really speed up the popular method – waterproof sandpaper on a glass plate – by adding just a teaspoonful of this powder. 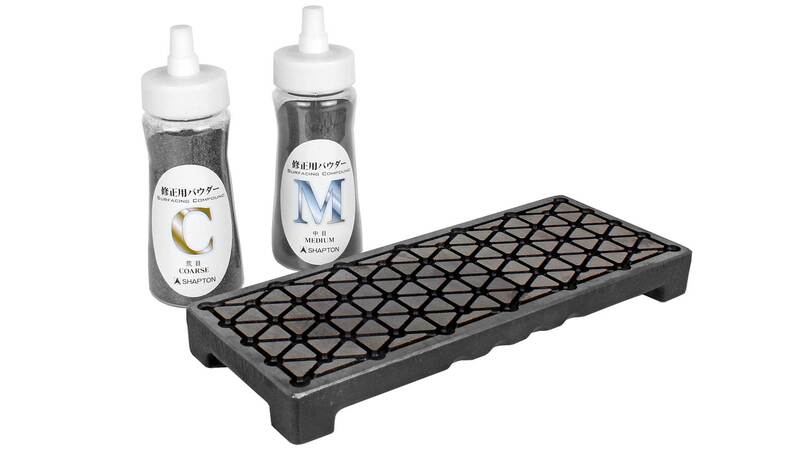 You will also increase the effectiveness of the Naniwa flattening stone with this powder. Also suitable for honing the backs of Japanese chisels blades on a steel flattening plate! Content 150 g.
This is the most versatile and useful flattening and sharpening block available on the market today. The side with the deep grooves (top photo) is for flattening sharpening stones, the side with small perforations is for flattening the backs of plane irons, chisels and similar tools. A 70 x 48 mm area on this side is free of perforations to prevent smaller tools from catching in the surface. 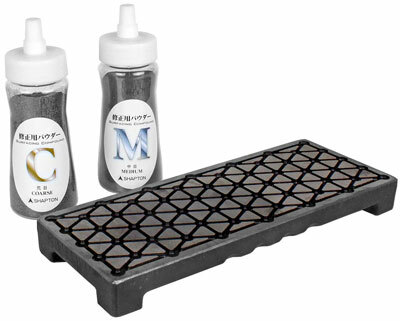 The two-part heavy rubber box serves as a slip-proof base when using the plate or as a holder for any other water stone. Use only water as a lubricant with this plate! 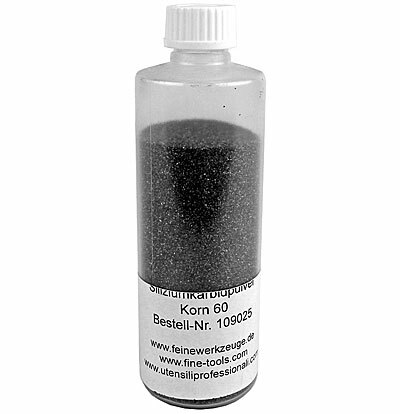 Note: If necessary, the diamond abrasive coating can be renewed at the factory for a charge of 250 euros (includes shipping to Japan and back to Germany).